Stunning MOVE-IN READY home! Located on an oversized .39 acre lot in the prestigious, tree-lined Valrico Village community with only 12 homes! Sitting on a quiet cul-de-sac, this homes curb appeal will draw you in from the moment you arrive with beautiful brick, mature landscaping and attractive elevation. The layout features a Formal Living Room, Formal Dining Room and Split 4 Bedroom plan. The newly updated Kitchen (with all appliances) has a spacious eating area overlooking the pool and private backyard as well as a Cambria Kitchen Bar which opens up to the large Family Room with a gas fireplace. Three sets of updated double-paned glass doors lead out to the relaxing screened Lanai with a newly updated pool and spa. The Master Suite is truly a retreat with French door exit to the lanai and a private office/Study, perfect for a home office or even a nursery! En-suite features a walk-in closet, dual vanities, separate shower and a Jacuzzi garden tub! Split floor plan keeps all three other bedrooms on the opposite side of the home for optimum privacy! An oasis awaits you on the screened Lanai with sparkling swimming pool and full privacy with no backyard neighbors and beautiful landscaping. 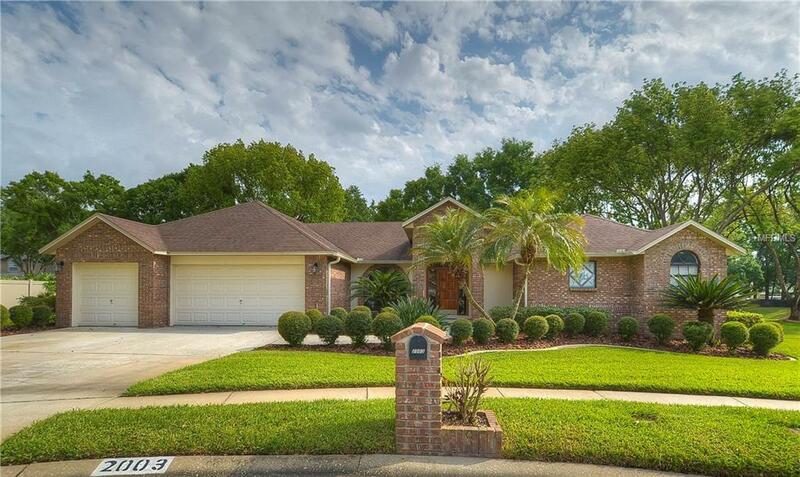 Enjoy the over-sized lot with a mature, lush landscaped yard with reclaimed water and in-ground sprinkler system. This spacious well-kept home is move-in ready for a new owner. Located close to schools, shopping, restaurants and easy access to I-4 and I-75.